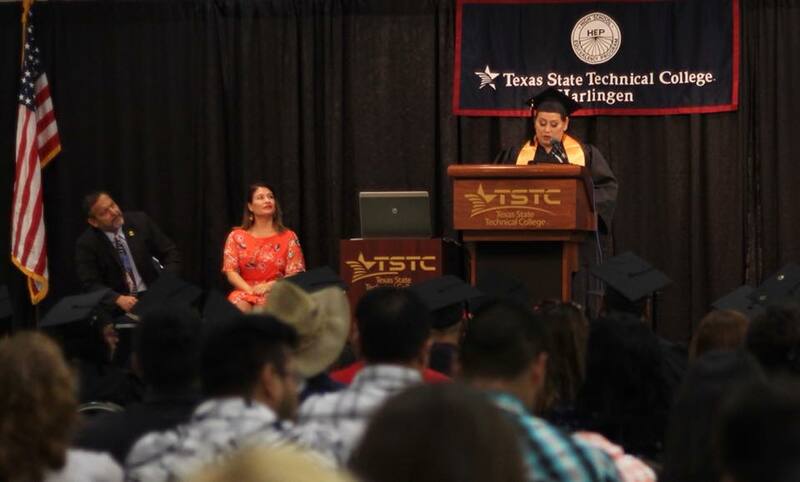 (HARLINGEN) – Juanita Salinas was looking for a better life when she decided to enroll at Texas State Technical College’s High School Equivalency Program (HEP), and last week she, and nearly 40 other students, earned a General Education Diploma (GED) during the program’s annual graduation ceremony. 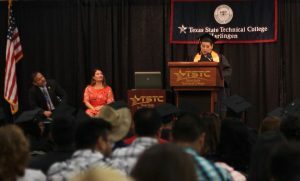 The HEP program at TSTC is federally funded drop-out recovery program that provides services to eligible migrant and seasonal farm workers from the mid to the lower Rio Grande Valley and prepares students to successfully pass their GED along with support services such as academic and career advisement. The Harlingen native, who used to work the strawberry fields of Mississippi with her family as a child, said after having a baby in high school at 15 she never thought this moment would come, much less be the class speaker. As a teen mom Salinas to dropped out of school to work and support her daughter. She held various jobs in the fast food restaurant industry before holding a job as a cafeteria cook for the Harlingen Consolidated Independent School District for 11 years. Now, her eight children and her husband celebrate her as she addresses her class with encouragement and hope for the future. Salinas said she decided to finally take this step in life because she wants to be a positive role model for her daughter who also had a baby in high school. TSTC HEP Placement Officer Daisy Avalos said she is excited to see Salinas and the rest of her students complete the GED program. The HEP program prepares GED students to test in the areas of math, science, history and English and gives students the opportunity to do community service. Those completing the program also have the flexibility to work and go to class, allowing TSTC to serve more than 100 students per year since its inception 18 years ago, many of which return to TSTC to get a degree. Salinas is now a student at TSTC pursuing an associate degree in Education and Training. Her goal is to become a special education teacher. For more information about TSTC’s HEP program, call 956-364-4505 or visit tstc.edu/harlingenhep.